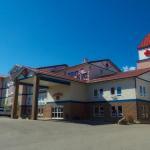 Free breakfast complimentary Wi-Fi and a perch near golf hiking and fishing entice guests at Best Canadian Motor Inns - Hinton. All 104 rooms at the four-story Best Canadian offer free Wi-Fi flat-panel cable TVs microwaves refrigerators and coffeemakers. Non-smoking rooms are available and there is a designated smoking area. Each morning's deluxe continental breakfast is on the house. The property hosts a business center with fax and photocopy services a guest laundry fitness center hot tub and indoor pool with a water slide. Parking is complimentary. The Best Canadian offers easy access to AB-16 and the Trans-Canada Highway and is three miles from the public Hinton Golf Club. The Alberta Forest Service Museum is two miles away. Hiking fishing and other outdoor activities are 20 miles away at William A. Switzer Provincial Park. The hotel is 32 miles from Miette Hot Springs in Jasper National Park. Edmonton International Airport is 193 miles away.